Something that every instructor needs to have, regardless of level, is a First Aid qualification. Skiing is an exciting, adventurous sport, but like any sport, comes with some risk. We can minimise it by following the 10 FIS Ski Conduct rules, as well as being fit and strong before we train or go on holiday. Despite this, injuries still occur, so every trainee instructor on our Residential BASI 1 and 2 courses is trained to treat a casualty. More importantly, they are trained how to keep them safe in mountain conditions. This is no average First Aid at Work qualification! In 2016 we decided to start running our First Aid courses in-house, as the best people to teach First Aid to trainee ski instructors are qualified ski instructors! Pete Miles trained to run our courses, and as a result is able to tailor the course to meet the requirements of a working instructor. If a client is injured during a lesson, your first priority is the casualty. However it’s also really important to keep the rest of the group safe too. Therefore our trainer teaches students how to manage their group, whether they be adults or children. In skiing, there are certain injuries that are more likely than others. Therefore, the trainer will focus on those aspects and train students to react quickly and effectively. Another unique aspect of the course is that it includes an outdoor element. Instead of simply demonstrating scenarios in the garden, the trainer takes students up on the mountain! Using their avalanche safety kits, students can venture off-piste to practice relevant scenarios such as broken limbs or concussion, and learn how to keep their client safe in the backcountry too. Lastly, students need to be able to call for help and get their client to safety. 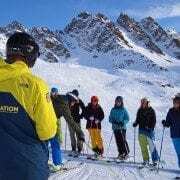 We include French lessons as part of our courses, so they are able to direct the Piste Patrol to their location. That’s why we include it in every scenario. By running our training in-house, we believe we provide trainees with a First Aid qualification which will equip them to deal with any scenario they might encounter. Keeping people safe is our number one priority, so we’re very proud to be a First Aid training centre. If you’re interested in becoming a ski instructor and getting your First Aid qualification, request a brochure now! Yasmin's Recovery Diary 1 - "Talent needs trauma"